I walked through Grand Central Terminal and spotted the long escalator on the main floor that would take me up to the MetLife Building. I took the escalator up and looked for my fellow choir members. I walked a bit and I saw a stage with risers and a piano. In the front of the stage was a Peace of Heart Choir banner with our logo heralding our public concert later that evening. As I looked around for our rehearsal room, a security guard complimented my festive brightly colored clothing and asked if I was with the choir and directed me down the hallway. I saw a room at the end—a glass door bearing the familiar Peace of Heart Choir sign with our logo. I walked in to the rehearsal room. There were refreshments including Cucina and Co. hot chocolate and I found Rene discussing which songs we would do. We ran through bits of each and then it was time to take the stage. We lined up and made our way onto the risers. There were about 50 chairs set up for the audience. To our left, was a Godiva shop, to our right a Cucina & Co. shop. Our backdrop was a Swarovski store. You could find even more sparkle in the center of the lobby behind the audience with a majestic Christmas tree perhaps 15 feet tall with dazzling ornaments of red and green and silver and gold. 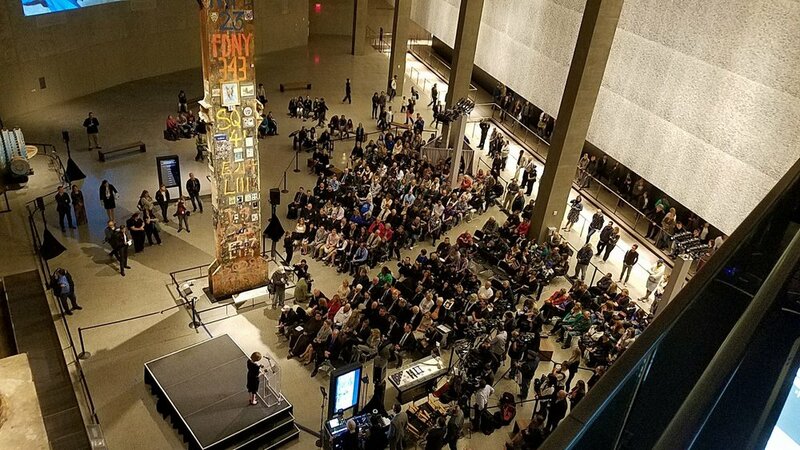 Our host, Judith Kaplan, thanked us for coming to perform and it was clear how important this MetLife Building holiday music program was to her. Her husband, Bernard, who had a great love for music and for the holiday season, had started the program and when he passed away, she decided to continue the program in his loving memory. For nearly 40 years, Bernard Kaplan was the inspiration and organizing force behind the choral program, the toy drive and many other initiatives at the building. 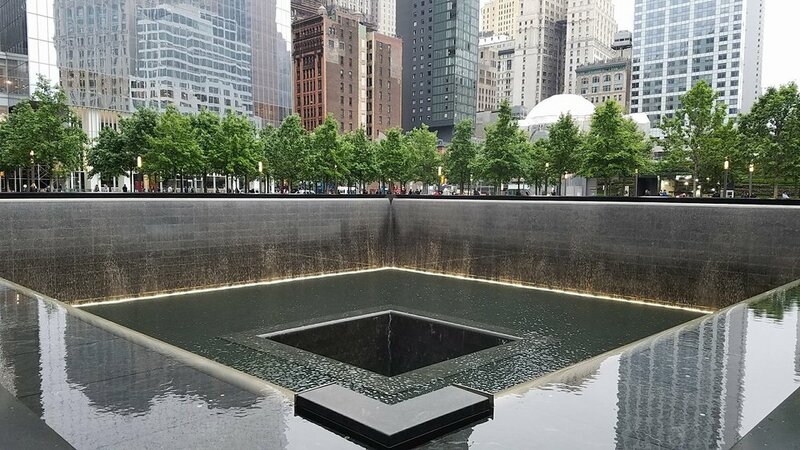 She spoke at length about this and how grateful she was to have us here today for our public concert as part of the MetLife Building Bernard Kaplan Memorial Holiday Concert Series. Gary introduced the choir and it was time for the music to start. Barry introduced our first song highlighting each of the principles of the seven days of Kwanzaa, “Seven Principles”, with nice vocal support from Gail. The MetLife Building lobby is a very busy corridor with the hustle and bustle of people leaving work and rushing to catch their train in Grand Central, others perhaps going back to work after a break trying to tie up some loose ends before the end of the workday. As soon as we took the stage, passersby looked at us. It was obvious that to many the music was a much-needed respite from a busy workday. Many people smiled as they passed by. One woman smiled at me and I smiled back and we waved at each other. Some people stopped for a while and sat down to catch some of the music before they moved along. Some passersby took video on their cell phones--one woman recording several songs with her cell phone. From a distance, I could see her cell phone cover with the shiny star in the center catching the light. 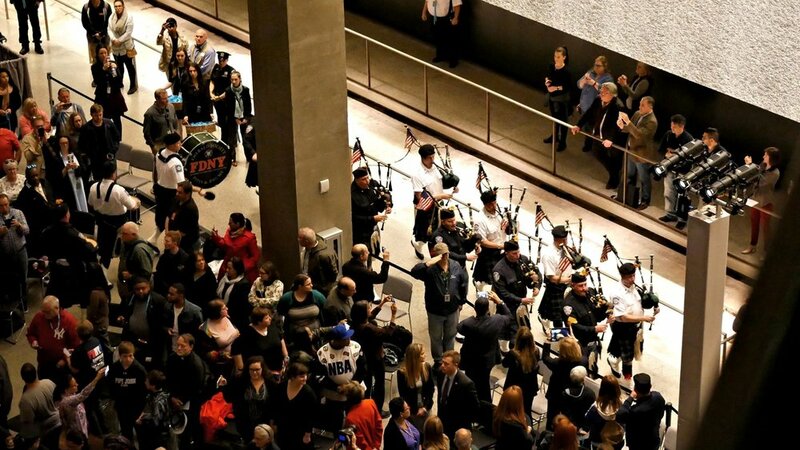 While others on the mezzanine level, stopped to watch the performance below. We were off to a great start. We continued with the Spanish love song, “Si La Nieve” with an introduction by Deb who had proposed the song. We sounded quite lovely and the audience started to grow a bit. I introduced the #1 hit single by Pharrell, the alto-driven, “Happy” and as I said in my introduction, “It makes us happy to sing it and I hope it makes you happy to hear it too.” It was exuberant and fun and obviously recognizable to many audience members and others passing through and brought smiles to many faces. The traditional Hebrew holiday song, “Al Hanissim” sounded lovely with Amanda on clarinet and Marv on accordion. 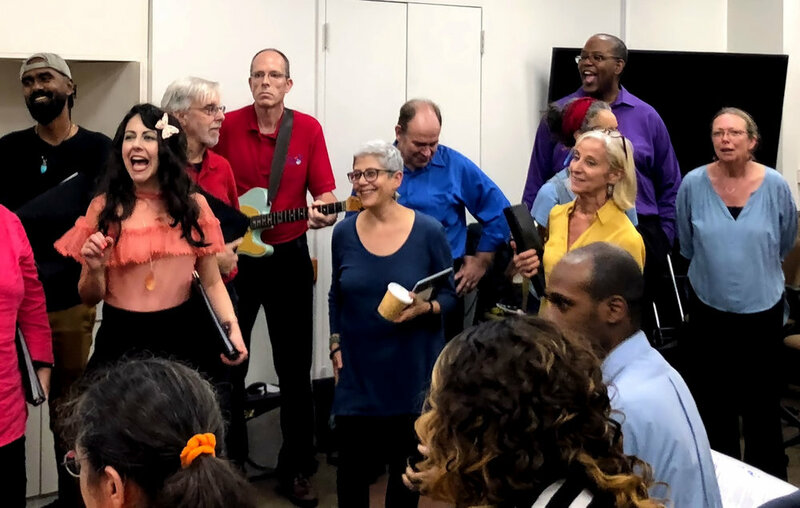 We did two sing-alongs, “Peace Like A River” and “Michael Row Your Boat Ashore” with Andrea and Rene providing musical accompaniment and lending itself to the energy and the exuberance of the pieces. The Korean love song, “Arirang” was lyrical and pretty with lovely musical support from Gail and Marv, both on flutes. 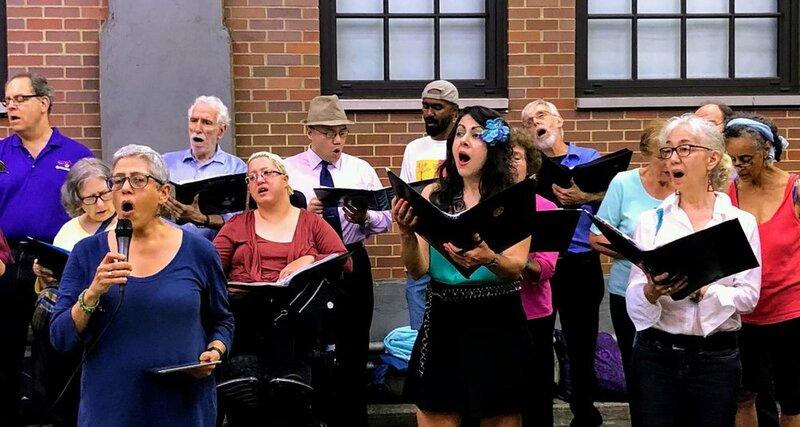 We did a wonderfully jazzy and lively choral rendition of the holiday classic, “Deck the Halls” with several passersby singing along and smiling. We performed several core songs from our repertoire. “That Lonesome Road” featured a sublime solo by Nancy. Gary introduced the Matisyahu call for peace, “One Day”, highlighted by lovely solos from Gwyn and Gary. 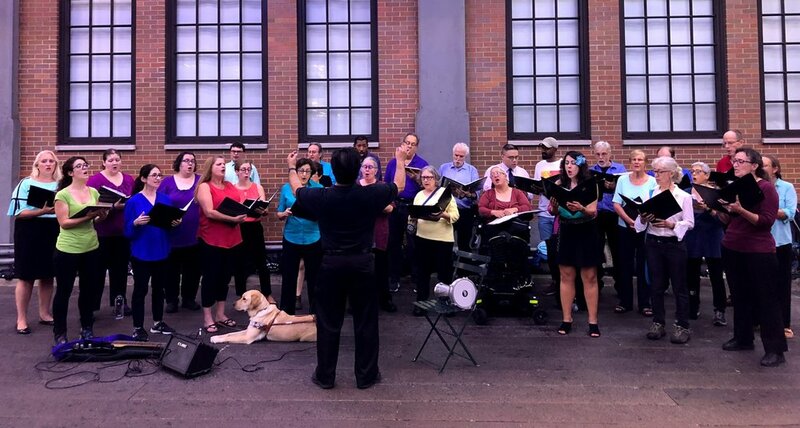 The song really resonated with the audience as many passersby stopped to listen and watch. 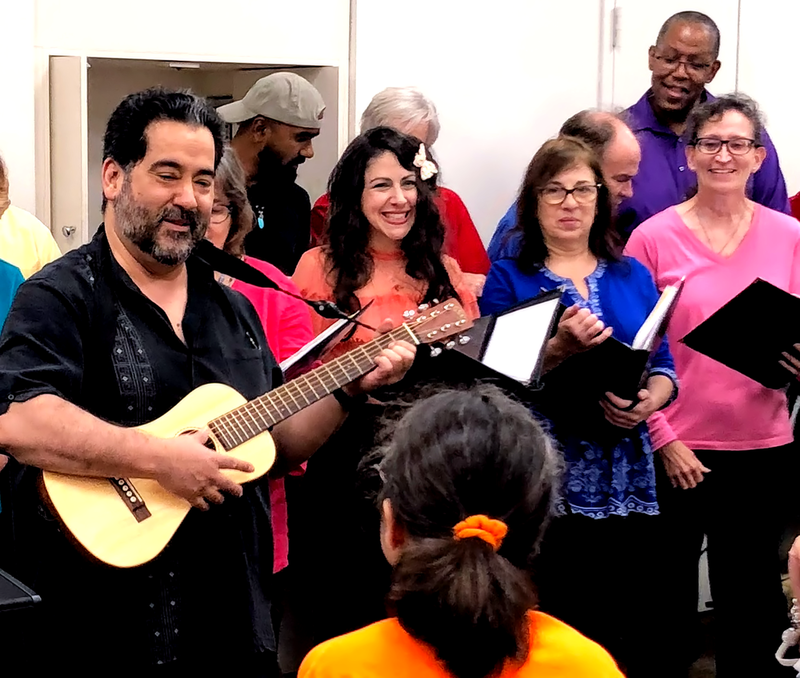 And of course, we performed the unofficial anthem of Cuba—always a crowd favorite—“Guantanamera”--with a wonderful introduction and musical accompaniment by Rene. Vivian introduced the signature closing of our choir, “Let There Be Peace On Earth” and explained the significance of the song in our times and how vital that peace begin with each of us. The song sounded great with a pretty solo from Deb. Rene directed us to take our bows. Our host, Judith Kaplan, effusively thanked us for performing and asked the audience if they would love to have Peace of Heart Choir back to which there was resounding applause—an affirmation of a lively and fun public concert where for a short time The MetLife Building was transformed by the energy of Peace of Heart Choir and the healing power of music that transported passersby to another plane devoid of the troubles of an average workday. I walked up to the entrance of the Jewish Community Center and found Alex waiting outside. We walked inside to see where we were warming up. I saw the various activities going on as part of the day. I walked up to two women and realized one of them was Gia, who had helped set up our concert. I complimented her on her shiny silver headband and then I took off my hat to reveal my shiny gold one. “It’s obviously ‘Shiny Headband Day’,” she said in solidarity with a smile on her face. Alex and I then went down to the lower level and met Noella and several other choir members along the way. The room where we would rehearse had obviously changed. Back up one flight again. We rehearsed a bit with a little lift from Lily’s delicious homemade sweet potato latkes and then it was time to begin. We were not allowed any musical accompaniment or even a pitch pipe for this performance in respect for the Holidays. In the JCC setting, we definitely included Chiribim as part of our program and included Od Yavo. The day was filled with family activities including face painting and this was obvious from the families and children in attendance. Our performance began with our signature opening number, Siyahamba. Gail and Lily provided lovely vocal support in our song of welcome, Wanemo. Od Yavo was fun and spirited as we sped up and slowed down at various points and built up momentum towards the end under Rene’s direction. Next was the Gaelic song, Geantri. One of our core repertoire songs, Michael Row the Boat Ashore followed. During this song, an adorable toddler in a navy blue and yellow shirt and overalls kept trying to grab the words we had handed out from his mother’s hand as she was trying to sing the words from the sheet. She eventually walked out with her toddler--guess he wanted to sing too. The Yiddish song, Chiribim, was next with spirited vocals and introduction by Lily. A lovely acapella version of Light One Candle followed. Next was the sing-along Down by the Riverside. Kwanzaa Song was on the original program but as we realized that it was a holiday song, it was excluded from this concert. 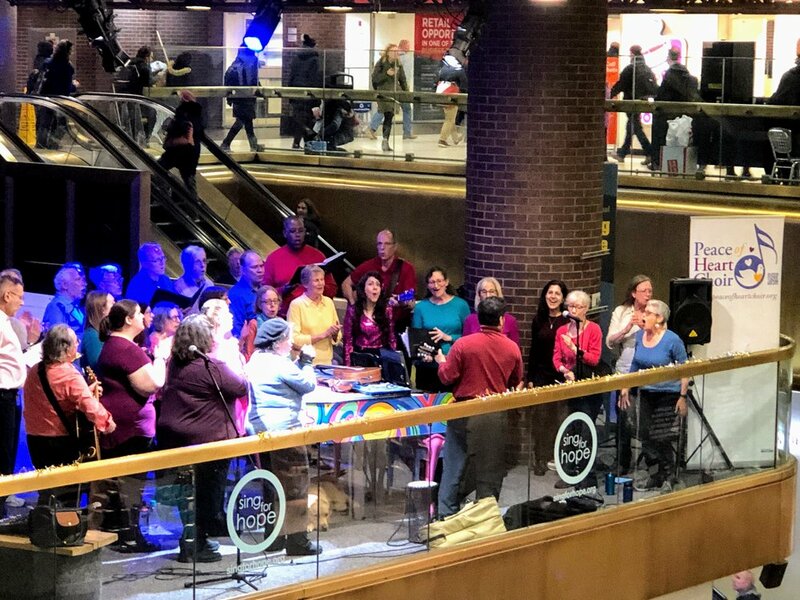 The sing-along Rock-A-My-Soul was next followed by a lovely acapella Give Us Hope and the Peace of Heart Choir anthem, a lovely Let There Be Peace on Earth. It was nice to look out into the audience and see several familiar faces from last year’s outreach at the JCC. After the concert, a lady thanked us for an enjoyable concert. I saw a happy child with brightly colored paint decorating their face who had just participated in the face painting activity. It was so nice to have again been part of this annual event. We gathered around Rene’s piano in Central Park for our first warmup of the season. It was hot and steamy, but we singers were in high spirits, glad to be together again after the summer break. Passers-by video’d our vocalizing and song snippets. They were delighted when we told them that was just the rehearsal – the concert was still to come and would be a few yards away, at the base of the statue. Rene was delighted, too – to find that even though we hadn’t had our first rehearsal yet, we sounded good. Kudos to all of us. We began the concert proper with a rousing rendition of “Siyahamba.” Then came the rest of our core songs, including sing-alongs, and also the non-core “Aquarius,” in which Gary let his soul pour forth. The crowd loved it. The wind came up, the way it does sometimes before a thunder storm, but we were lucky – no rain – just Rene’s music blowin’ in the wind. There were several POHC fans standing in a semi-circle in front of us--former choir members; new choir members; spouses, parents, and friends of choir members; an admirer from YAI. They were giving out Insomnia Cookie coupons to passers-by, in preparation for our next gig of the evening. Behind them, leaning on bikes or on trees, were the unaffiliated, strangers who just got pleasure out of listening to us.